Sampler patterns are created one block at a time and we have found the perfect sewing inspired sampler! It is called Spooling Around the Block. If you have never participated in a Saturday Sampler you are in for a treat. 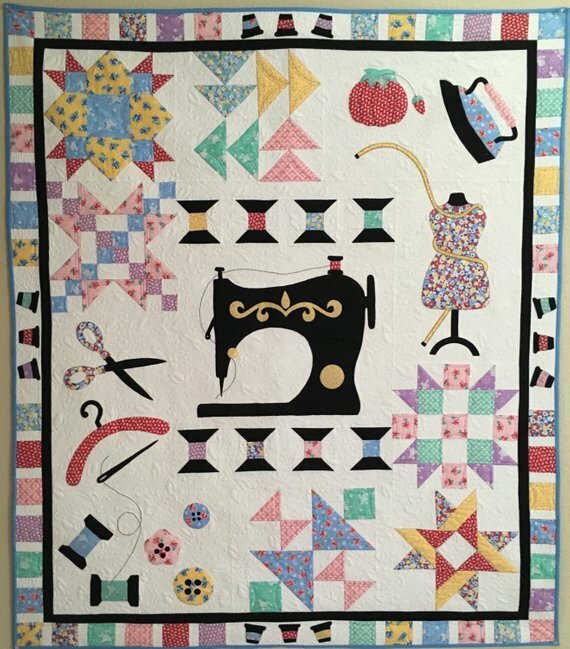 On the third Saturday of the month (Month 1, February 16) you are invited to attend a special early preview of the completed quilt, a demonstration of how to construct the first block and receive the fabric for that block along with the complete pattern. Bernina in Stitches will open the doors from 8:45 am to 9:00 am just for you, so don't be late. On Months 2 through 12 you will need to bring your completed block from the previous month to receive the current months' block fabric free. If you have not completed your block you may pay $10 to receive the fabric for the next month. We will always demonstrate the construction for the block and have show and tell with your completed blocks. It is possible to get all 12 blocks for the quilt for the cost of registration! What could be better than that? Just wait because Bernina in Stitches will be offering each participant who attends the demonstration a special discount which is only good that day. Registration for the 2019 Saturday Sampler is $50. If you are unable to attend the Saturday demonstration on the third Saturday of the month at 9 am. you can still receive the fabric for the block for a fee of $10. The Sampler will be a mix of fabrics in true sampler style. Please note it will not be the same fabrics that are pictured on the pattern. If you need a little extra help constructing a block then plan to attend an open sewing day and the staff will be happy to help you. A finishing session will be scheduled for all who wish to attend after all of the blocks have been constructed. You need to register either by calling Bernina in Stitches at 423-283-0456 or visit us at www.berninainstitches.com and select Saturday Sampler. Please register no later than February 9, 2019. The backing and batting are not included. Coordinating backing fabric will be available for purchase on a first come first served basis.